“Agent Green” investigator Andrei Ciurcanu could hardly believe what he found in the middle of Romania’s Rodna National Park: A fully automatic wood chipper machine, cutting trees and instantly chopping them into little wood chips to be sold to „bioenergy“ industry. I’ts not logs any more leaving the national park, but many many unmarked (and therefore uncontrollable) pieces of wood. This makes it even more easy to launder illegal logging. Wood chips mainly end up being burned in the bioenergy sector – entering the atmosphere as carbon emissions and intensifying the climate crisis. According to the new report „EU Forests in Danger“ by the NGO Fern bioenergy industry is becoming the number one threat to Europe´s natural forest remains. The EU wood processing industry is heavily pushing for the increased use of wood (also directly from forests, not just from wood waste) for energy purposes. They claim this is good for „climate protection“. However, numerous scientists and environmentalists counter this by arguing that burning trees leads to increased carbon emissions and thus adds to the climate crisis. Regrowth of forests happens too slow to compensate the emissions in time. Therefore they call for improved protection of intact forests and expansion of woodlands – rather than logging and replacing natural forests with plantations. Back to Rodna National Park. Agent Green Investigator Andrei Ciurcanu says, the use of this wood chipping device proves it being likely that illegal practices still happen on large scale, even in the forests of a national park. The wood thieves just use the official system of traceability (SUMAL) and its weaknesses: Romania still doesn’t have an online registry of logging depots, thus it is very easy to use the depots as a laundering places for getting illegal Wood out. In this case not only the depots are used to launder the illegal wood, but also to transform illegally cut trees into unrecognizable wood chips. Then the wood could be sold to wood processing or trading companies with official papers, giving the appearance of legality. În Parcul Național Munții Rodnei lemnul tăiat ilegal este tocat și apoi vândut firmelor de procesare from AGENT GREEN on Vimeo. 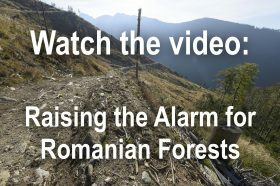 The official investigations led by Romanian authorities (Forest Guard inspectors) in the area where the chipper was present revealed that a Romanian logging company was authorised by a Private Forest District to enter the National Park and received legal permits for „accidental logging“ (trees affected by windstorms and landslides). Thus, the timber quality is medium or low. However, the investigators discovered that the company employees logged not only damaged trees but cleared the whole area. They found 91 stumps without a the sign for legal logging approval (hammer). The overall loss was equivalent to more than 10.000 euros. The illegally harvested wood was afterwards mixed with other logs and sold or transformed into woodchips. They attached papers, as if the timber was sold from a depot. But the Investigators not only discovered illegally cut stumps. They also found out that in the Lala region (where the chipper was filmed) not one legal depot was authorized by the Romanian institutions. So all the papers used for transporting and selling of the wood chips were obviously forged. In brief: the woodchipper was obviously also used to transform illegally cut trees into wood chips. The growing market for „biomass“ could make fishy practices like this more attractive and lead to additional forest destruction. Basically the logging and transport company apparently wanted to avoid registration of the woodchips with the Romanian SUMAL System. This requires a mandatory online registration of all transports of logged wood from the forest to a processing factory or a depot located outside the forest with a unique SUMAL online code. 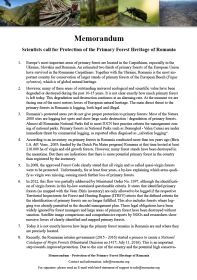 They used only accompanying documents pretending that the wood was transported from a depot to a factory, which does not require an online code according to SUMAL and the romanian legislation. This trick was intentional to hide the origin of the wood. In case of a police control it would have been impossible to see whether the wood was legally cut or not. During routine control the police only sees that the transport appears to be legal because it is accompanied by official papers. The illegal logging is investigated now by the prosecutor and there is an ongoing penal investigation. Romanian TV reported about this case. Which companies appear to be involved? 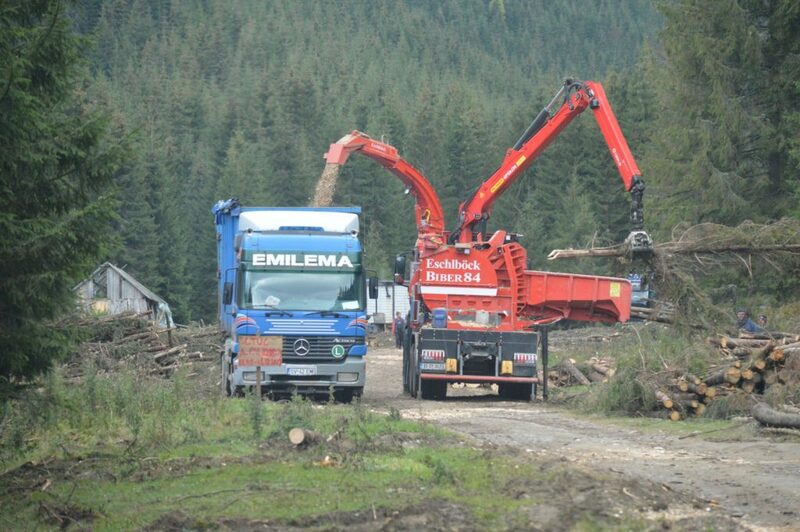 The official investigation led by forest inspectors revealed that the woodchips were made by a chipper owned by a company named Austroforest and the transport by Frasinul Ltd, both owned by a businessman called Traian Larionesi, important partner for Holzindustrie Schweighofer. His name is connected to different corruption cases investigated by the Anti Corruption Department in Romania. The forest inspectors also found out that the woodchips were sold by Frasinul to the big Austrian timber processing company Egger. The company runs Romania’s largest biomass power plant (83 Megawatt) in Radauti , where Egger also operates a huge sawmill. We complain about forest destruction worldwide. But what about protection of forests on our own doorstep? The EU in general is supporting programs to protect forests globally, through development aid, innovative trade work such as the EU Forest Law Enforcement, Governance and Trade (FLEGT) Action Plan, and commitments to end EU consumption of goods that cause agricultural deforestation. Officials from all over the EU have been supporting calls on countries hosting large forest areas such as Brazil, Indonesia, DRC or Russia to halt excessive logging. But at the same time, less than one per cent or the EU’s forests are still in a primeval or very natural status. And many of these stands are not sufficiently protected. Even in the EU’s Natura 2000 sites old growth and virgin forests are being logged – legally and illegally. A substantial share of the harvested timber from EU’s last natural forest stands ends up in bioenergy industry. 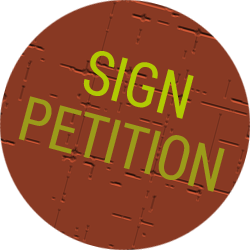 The NGO Fern published the report „EU Forests in Danger“ about the progressing loss of Europe´s last natural forests. Country reports from 11 EU member states (including Romania, Slovakia or Sweden) draw an alarming picture. Final conclusion: „we must also protect the natural and old-growth forests on our own doorstep“. Save our Paradise Forests now! from AGENT GREEN on Vimeo. OUT OF CONTROL || Case #5 || Rodna Mountains National Park from AGENT GREEN on Vimeo.